If you don’t already know, I'm Squall Charlson, and yadda-yadda-yadda; I make videos about tokusatsu, movies, and sometimes video games over on my YouTube channel. Cool, now you’re caught up. So why Patreon? I’m a busy boy and usually only make videos as a fun hobby, or when commissioned. So what you see on the channel is reflective of my time, and it takes a bunch of it to make some of my videos. I want to do this full time (this means less irl job work). I will let the content speak for itself, but imagine having more of it, more often. That’s where Patreon comes in. I want to recognize and reward you, the viewers and fans of the channel for supporting me and helping it grow. But where does the money go? I could say something obvious like into the bills I am usually paying (house, utilities, services, ect. ), but most, if not all, goes back into you and the community. I want to give you more in terms of being here and a part of the growth; that’s why some of the tiers to the right have physical rewards. The pins you will start to see rolling out are going to be a monthly incentive, meaning once they’re gone, there’s a good chance you will never see them again. And they’re only going to be found right here too. The remainder of the proceeds will go into gear and tech. I pay for the monthly Adobe CC suites, and I would like to upgrade some equipment as we go. If we can start to raise enough I would be able to start paying for help to shoot and star in future videos (think more narrative work) or even commission an artist to make artwork for future videos. This is a platform and channel I can use to showcase many other talented artists, and I am so excited to start doing that! I honestly believe we need more original tokusatsu content online, and I would like to help those around me grow and succeed too. This tier also gives you basic Patreon Discord access over on my server! Do you like collectible pins? Do you like this channel well enough to donate not one, but TWO whole dollars? If you answered yes to one or both of those, this tier is for you! Each month I will be creating a monthly Patreon collectible pin that will be sent out to everyone who is an active patron at this level. Above is an example of the first month’s pin! These pins will only be available for the month they go out, so be sure to check back to see the new designs moving forward! This includes the previous tier rewards above. There will also be a handful of other videos and content only viewable to those on this level and above. This includes all the previous tier rewards so far. Do you really like collectable pins? This tier might be for you! 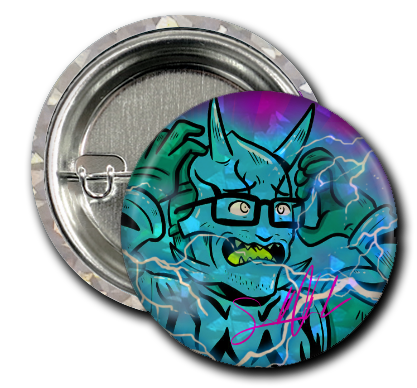 Each month I will be creating a new monthly collectable pin (see $2 tier), but I will also be creating a rare monthly pin on top of that which you can only get at this level! These pins will be sent out to all patrons each month who are active at this level or higher! Above is an example of the first month’s rare pin! These pins will only be available for the month they go out, so be sure to check back to see the new designs moving forward! In the credits of every movie, you always see the names for the “producers”; but what exactly does that mean? These are the people that without the support and guidance, the entire work would be different or even non-existent. I want you to come on board to help shape and lead this channel. This comes with a special mention each month in a video as a way of saying thanks. You’ll join the elite in helping plan and work different ideas for the channel, as well as some special YouTube live stream benefits. If you want to gain traction and hit the ground running on YouTube, this might be your best option! I’ll even include a video of yours to shout out each month at this level at the end of one of my videos! Sponsors wanted! No not like AAA sponsors (not yet at least). Videos on my channel can range anywhere from 5k to 80k on average. Imagine having that many eyeballs on something you own or run. This level would include a segment to highlight your business on a video each month to hundreds and thousands of potential buyers or viewers. Reminders at the beginning and end to maximize for yourself. What more can I say? This level is for those who want some awesome and cheap advertising! This includes the previous tier rewards above (if wanted). This probably has something to do with pins again, right? Correct you are! This third goal for the Patreon will yield a mythical rare monthly pin, and it's only going to be guaranteed for those at a certain tier level. But don't fret, everyone who isn't quite at that level will still have an opportunity to snag one of these in the coming months! All patrons active during the month this is reached will get it! From then on out, only those at the certain tier will be sent the new ones!